I’ve been working full time for a number of years, and for awhile I’ve had the urge to strike out on my own as a full time freelancer, so I can have the flexibility to work for myself. How do I set myself up to make sure I have a steady stream of clients (and income) coming in? This is definitely a loaded question, and depends what you do for a living. It’s a great time to act on the entrepreneurial spirit and explore alternate income streams, whether you’re freelancing on the side or working full time in your own business. The thing to remember, however, if you’re just starting out as a freelancer or independent… is that it takes time, and there is no shortcut. A client said to me yesterday, “So this is something you do on the side for extra income, right?” to which I replied, “Not at all – this is my full time job. I work 40/50 hours a week doing this.” And while I think that scored extra credibility points in his mind, I also got the impression he was surprised that someone could be making a full time living writing resumes. You can – a very good one. But it also took me 3+ years and many revised drafts of my business plan to get here. It’s important to not only be open to that cycle of change and evolution when you have a business, but to also expect it. Get clear on the 5Ws. Know what you want to do, who you want to serve, why it’s of value to them, and when & where you will make it available. And then price it accordingly. Practice telling people what you do. The more comfortable you become referring to yourself as your new title and explaining what you can do, the lesser the chance you’ll fumble it up in front of clients when it really matters. Figure out what professional connections you already have that you can leverage for projects and work. Be careful of violating any non-compete policies if you’re remaining in the same line of work as your former employer. But do look at past clients, colleagues, supervisors, and other vendors you may have worked with who might be able to refer work to you or be a potential client themselves. Tell everyone you know about your new venture. Don’t assume friends, family and colleagues don’t know people who can potentially use your services. My biggest revenue source to date, in revenue and in client volume, has been referrals. Have a solid 12-month financial plan in place before you quit a full time job. While it’s great to be optimistic, it’s better to be realistic around the fact that new businesses take time to generate revenue. You don’t want to be building your business from a place of desperation. Update your LinkedIn profile and all of your social media profiles. Even if you’re not billing hours right away, that does’t mean you’re not a serious practitioner of your craft. Get the word out, because that’s the only way the money will come. Create a business plan. Even if you don’t think you need one, you need something to guide your financial planning, decisions around product development, understand the competitive landscape, and plot out your target audience. And as your business evolves, so too will your business plan, and putting long and short-term goals in place will help you track and get a better sense of what’s working, and what’s not. Referral business is free. $300 per month worth of ineffective Google advertising isn’t. And finally, put a timeline in place and choose a date to kickoff your transition. Whether it’s the day you plan to give your notice, officially launch your business, or be working completely on your own, it’s much easier to set a specific date and work backwards toward your goal, then to sit around and wait for the right opportunity and timing. Having a deadline-based goal for making a transition will help you plan much more effectively from a financial and personal perspective, and you’re more likely to stick to it if you have it in front of you visually. 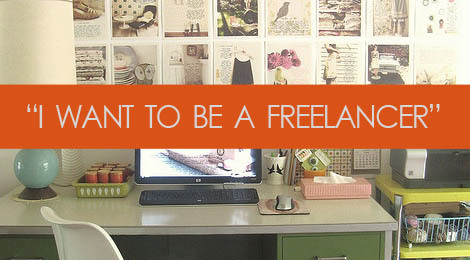 Tags: career, career change, entrepreneurship, freelancing, small business, transition. Bookmark the permalink.